Which may make you wonder: Is it even possible to move your entire wine collection? Of course, it is but it won’t be easy. 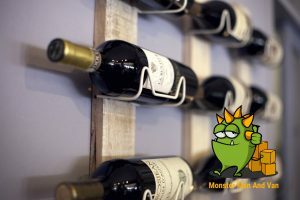 Will movers agree to move your wine collection? Many wine lovers automatically assume that professional home removal companies in London do not deal with the handling of alcohol. That, however, is not always the case which is why you should ask your movers (even before hiring them) if they will agree to transport your wine collection. Also, don’t forget to research whether they have any previous experience moving valuable alcohol. There are also a few exceptions in which moving companies will not agree to organise the transit of your bottles of wine. Let’s say that you have hired a trusted man with a van in Morden Park SM4 and you are planning to move to within Greater London. In such a case, your movers will probably agree to take on this job. However, if you are relocating internationally, you should know that most countries around the world have strict regulations for the shipping and importation of alcohol which will make this process difficult or even impossible. Exposing your wine collection to extreme temperatures or temperature fluctuations is the fastest way to ruin a fine bottle of vino. Therefore, rely on a seasoned man and van in South Wimbledon SW19, for example, that drives a temperature-controlled moving vehicle. Most wines can survive temperatures that range between 13 – 21°C without a problem. Let your movers know that. If you have decided to use the professional assistance of a moving company, it will be a great idea to find one that offers reliable packing solutions in London. Skilled packers know how to prepare pretty much anything for the road. But even if you prefer to pack your wine collection all alone, you will still need some help from your removal firm. Only such a company can provide you with special moving boxes that are sturdier and more durable compared to regular cardboard boxes. Remember to label each box and to mark it as “Fragile.” Also, even if you are moving within the same neighbourhood, transport the bottles on their side. The most risk-free solution here is to rely on a moving company that offers efficient removal of fragile items. When packing the glasses, start from their stems and carefully and meticulously wrap them with bubble wrap. Pack your wine glasses in a separate box to prevent them from accidentally breaking.